Stalked by God: Happy Birthday!! 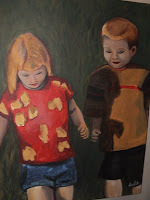 A few years back, when I had my "big" one, she painted this picture of my kids for me. (It's from a picture I took the previous summer in our new backyard.) I opened it at the post office.... and wept. We didn't always see eye to eye growing up, but have grown into friends as adults. My kids and I always look forward to our annual visits to Massachusetts and Maine, when we stay in her home, visit her cabin and enjoy her family. I admire her hard work, her determination and her ability to confront difficult issues. She is a talented artist, and has an innate knack for making things beautiful. I have thoroughly enjoyed watching her bring to life the visions she has for her home, her little backyard and her "big backyard". Her creativity-in-action and her mothering inspire me and encourage me to strive to higher standards. I have failed to commemorate this birthday of hers in a timely manner. I hope she knows how much she is loved.